1. 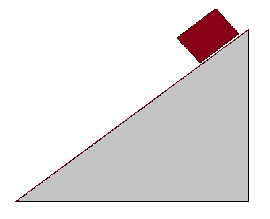 A 2kg block of wood slides down a 45°slope of length 2m. If the coefficient of friction between the slope and block is 0.4 calculate how much thermal energy will be transferred to the slope/block? Hint: Solution:	2. The resistance of a length of wire is 100Ω at 0°C and 120Ω at 100°C. If the resistance of the wire is linearly related to the temperature determine the temperature when the resistance is 112Ω.